Above is a pic from one of this week’s charters with a group from Illinois. Two of three anglers fish with me 10-12 times a year and it’s always a pleasure spending the day with them. This week’s trips have been full of Bull Reds. 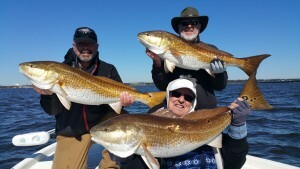 To see more pics and videos from this week be sure to LIKE Lost Bay Guide Service on Facebook.